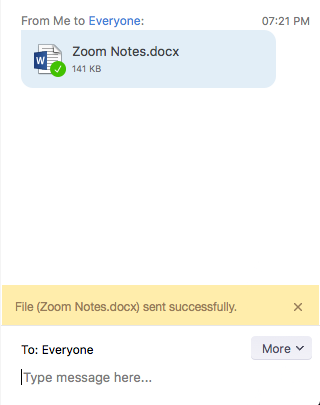 In-Meeting file transfer allows you to send files to other meeting participants during the meeting through the in-meeting chat. Navigate to the File Transfer option on the Meeting tab and verify that the setting is enabled. Navigate to the File Transfer option on the Settings tab and verify that the setting is enabled. During a Zoom meeting click on Chat. 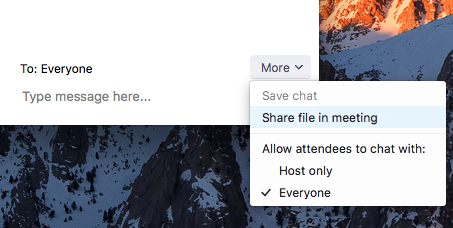 Select More and choose the option to Share file in meeting to send a file. The following indication will be seen once the file is successfully sent. The participants will see a notice when a file is sent and will be given the option to download the file. Once Download is selected, they will be able to view the file.